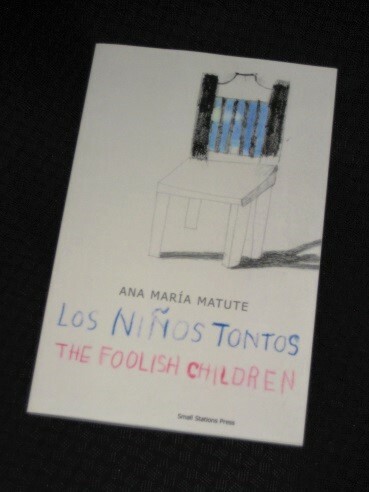 Ana María Matute was one of Spain’s most successful modern writers and received the prestigious Cervantes Prize in 2010. One of her best known works, Los niños tontos (first published in 1956), is a collection of twenty-one micro-stories, the majority of which take up less than a page. Each of the stories focuses on a nameless child, one of the ‘foolish children’ of the title, with most of the protagonists meeting a grim end within a paragraph or two. Of course, there’s far more to the work than truncated Grimms’ Tales, and Small Stations Press have brought out a beautiful bilingual edition, translated by María del Carmen Luengo Santaló and Aileen Dever, placing the Spanish and English versions side by side. In addition to bringing the stories into English, the translators have provided an introduction looking at the writer’s life and career, a note on the history of micro-fiction in the Spanish language, as well some helpful hints for deciphering the stories. The girl’s face was dark and she had eyes like sloes. However, the story doesn’t really go as you might expect. It’s a rather strange piece in which the girl hides in the bushes and is spoken to by the earth, with a rather obscure ending – so what’s it all about? A quick look at the notes provided by the translators shows suggestions of biblical undertones (apple, garden), but more surprisingly, there are some rather less religious allusions. The flowers that appear in the girl’s mouth towards the end of the story turn out to be from a local ritual for the dead, and as for the ‘cintas azules y moradas en las muñecas’/ ‘blue and purple ribbons on her wrists’ – well, this is actually hinting at bruises and handcuffs… A final note explains what’s happening here. Quite apart from ‘ordinary’ prejudice, the story is dealing with the brutality of the Franco era, where people were regularly arrested, beaten, tortured and murdered, and that’s what Los niños tontos is primarily concerned with. In her twenty-one fable-like creations, Matute is having a subtle jab at the dictatorship she has found herself in, in the only way she knows how. Los lapices del niño eran naranja, rojo, amarillo y azul. El niño prendío fuego a la esquina con sus colores. The child’s pencils were orange, red, yellow, and blue. The child set the corner on fire with all his colours. Cuando el niño llegó al borde del estanque, se agachó, buscó grillitos, gusanos, crias de rana y lombrices. Iba metiéndolos en un caja. Luego, se sentó en el suelo, y uno a uno los scaba. Con sus uñitas sucias, casi negras, hacia un leve ruidito, ¡crac!, y les segaba la cabeza. When the child reached the edge of the pond, he squatted down, looking for little crickets, caterpillars, tadpoles and earthworms. He put them in a box. Then he sat on the ground and took them out one by one. With his little dirty nails, almost black, he made a slight sound, crack!, and sliced off their heads. It’s a disturbing image, and it’s clear that Matute is using it to show what growing up in a soulless society can do to you. I really like the sound of this. I hadn’t heard of Matute, though I see she has had a few books translated into English though all are out of print now. Grant – Definitely a big name- I wonder if Small Stations will look at getting more of her work out.